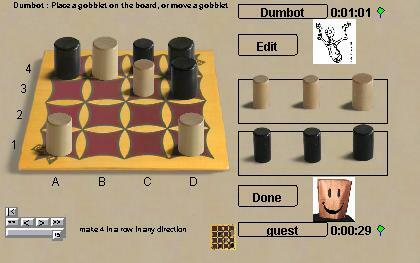 Gobblet is a game similar to four-in-a-row, but the pieces are gobblets of four different sizes. The larger gobblets can be used to hide the smaller ones. Each turn, you can either add a new piece to the board, or move a piece from any position to any other position on the board. When adding a new piece to the board, you can only cover an opposing piece if it is part of a row of three opposing pieces. In the official rules, Gobblet is a memory game. If you pick up a piece from the board, you must move it. If you pick up a piece that reveals a win for your opponent, you lose immediately. Obviously, using only your memory can't be strictly enforced in internet play, so in the standard game, boardspace allows you to peek under your own gobblets. The memory game is also available as variation GobbletM. Robots: The dumbest robot will beat beginners, or any inattentive opponent, but has weaknesses. On the other hand, the best robot is very, very good; challenging for even the best players. The back story: My wife gave me Gobblet for Christmas (after research, she said). It proved to be a good game, and therefore a good candidate for Boardspace. I was able to locate Thierry Denoual who gave permission.